Most people realize that the national language of Mexico is Spanish and that Mexico is the world’s largest Spanish speaking country. In fact, its population, now numbering 105 million, represents about one-third of all the 330 million or so Spanish speakers in the world. Spanish is the majority language in nineteen other countries besides Mexico, and is the world’s third most spoken language, after English and Chinese. Far fewer people realize that, in addition to Spanish, another 62 indigenous languages are also spoken in Mexico. This makes Mexico one of the most linguistically diverse countries in the world, in terms of the number of languages spoken, behind Papua New Guinea, Indonesia and India, but well ahead of China, Brazil and just about anywhere else. Some estimates put the number of different Indian languages in use at the time of the Spanish Conquest in the 16th century as high as 170. This number had dwindled to about 100 by 1900, and has continued to decline to the present day. The latest estimates are that at least 62 distinct languages (and 100 dialects) are still spoken somewhere in the country. 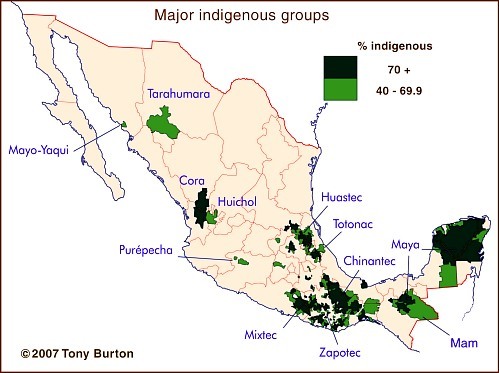 The largest indigenous groups are those speaking Nahuatl (2,563,000; dispersed locations, and therefore not shown on the map), Maya (1,490,000), Zapotec (785,000) and Mixtec (764,000), followed by those using Otomí (566,000), Tzeltal (547,000) and Tzotzil (514,000). Other well known groups include the 204,000 having Purépecha (or Tarasco) as their first language and the 122,000 speaking Tarahumara. At the other end of the spectrum, only about 130 people still speak Lacandón and only 80 use Kiliwa. Only 60 people still use Aguacateco in Mexico and only 50 speak Techtiteco (or simply Teco), though both languages are spoken by several thousand Indians in neighboring Guatemala. Of course, we shouldn’t forget that many Mexicans not only speak Spanish and/or an indigenous language, but also manage pretty well in English, French, Japanese and many others! Indigenous languages and cultures are analyzed in chapters 10 of Geo-Mexico: the geography and dynamics of modern Mexico.